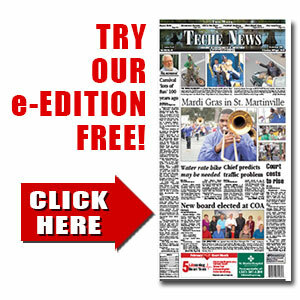 Kevin Jude Picard | TecheToday.com | Teche News | St. Martinville, La. St. Martinville – A Mass of Christian Burial was celebrated at 1 p.m. on Monday, November 13, 2017, at St. Joseph Catholic Church in Parks for Kevin Jude Picard, 49, who passed away on Thursday, November 9, 2017, at home surrounded by his family. Visiting hours were observed from 8 a.m. until 10 p.m. on Sunday and continued on Monday at 7 a.m. until 12:30 p.m. at Pellerin Funeral Home in St. Martinville. A rosary was prayed at 7 p.m. on Sunday. Rev. Bryce Sibley officiated at the Funeral Mass. Interment followed at St. Michael Mausoleum in St. Martinville. Kevin was a loving husband, father, brother, and friend. He enjoyed spending time with family and friends, being outdoors, fishing, camping, boat riding, and especially loved riding his motorcycle. Kevin was very devoted to his family and was always there for others when they needed him. He will be remembered for his kind heart and loving spirit. “I have fought the good fight, I have finished the race, I have kept the faith.” (2 Timothy 4:7). He is survived by his loving wife of 24 years, Holly B. Picard; son, Kevin J. Picard II; brothers, Michael Schouest and wife Connie, Leland Schouest and Alfred “TJ” Blanchard Jr. and wife Teah; sisters, Karen Viator and husband Lance, Gabrielle Noel and husband Todd, Lainey Wellbrock and husband Jason, Shelly Picard, Shelia Racca and husband Ricky, and Penny Champagne and husband Ricky; his step-father, Alfred Blanchard; and numerous nieces and nephews. He was preceded in death by his father, Dieu Donne Picard; mother, Lana Q. Blanchard; and his paternal and maternal grandparents. Pallbearers were Michael Schouest, Leland Schouest, Alfred “TJ” Blanchard Jr., Tyler Viator, Wilton Laviolette and Kim Pelous.